When it comes to my little baking challenge (baking all the challenges of The Great British Bake-Off, yadda ya), I never pay attention to the time limitations imposed on the bakers during the GBBO. I also make other adaptations based on the stomach capacity of my two-person household, in order to minimise waste, but ignoring the time management aspect is probably my biggest deviation from The Great British Bake-Off. This is mostly because I have to try and fit the baking around my life and sometimes life involves making cake layers and then wandering off for several hours before filling. In making this three-tier cake for the showstopper challenge of series two’s first week (cake week), however, I was up against the clock, as I was making it for my birthday party, taking place that very evening [NB more details on the stipulations of the challenge below the jump]. I had intended to get started on all the cookery bits the night before but ended up staying out late – very late – at a colleague’s leaving drinks and yapping for hours with my colleagues about work, relationships, imperialism and the colonial legacy and intervention in Syria (in that order, as the night wore on and the drinks flowed). I had also decided to occupy my oven for much of the day by making potted beef (slow-cooked; very slow) and spent a lot of time making salmon mousse and gougeres and three different jellies and chocolate-coated marzipan balls and chocolate cherries and all kinds of fiddly bits. Then, finally, cake. I decided, well, maybe the tiered cake can be for another time. But as I made decent progress I returned to the idea of the tiered cake, which I had been planning for some time. How could I let my friends down! When else would I have enough people round to gobble down a three-tier cake! Suddenly, there was about an hour to go till the party, the kitchen was a mess, I was a complete mess, smeared with chocolate and flour, sticky and crispy with sugar, and I was approaching bake meltdown. Cake layers were all over the kitchen, ganache was too melty and the cakes I had stacked were gently sliding apart. I knew what it must be like to be a GBBO baker. I wiped my tiers (ha!) (and my tears), put the cakes together and, just before serving, piled the cakes high with squirty cream. 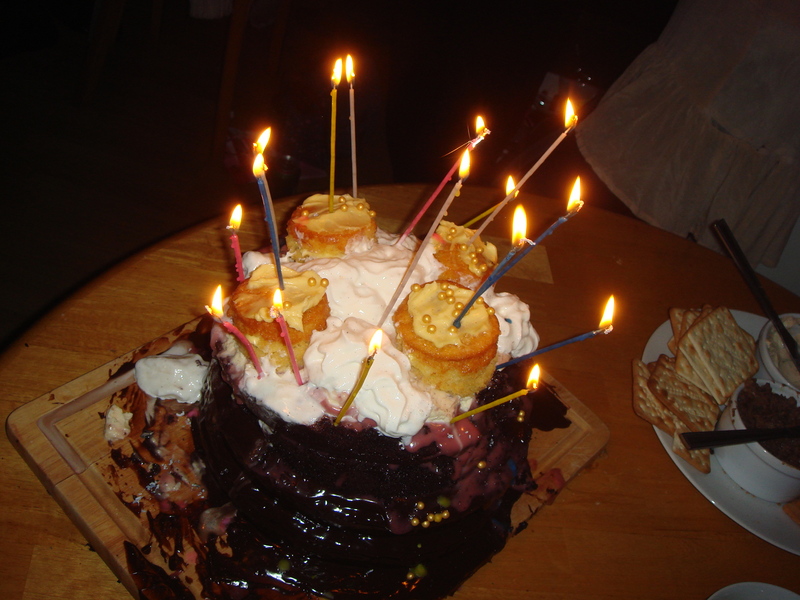 My friends lit the sparkler candles, the lights went off and my horrible, melty, monstrous three-tier cake was served. And unlike Paul and Mary, who would have needed to judge harshly, my friends were kind and full of compliments, and I remembered that I could have served them a slab of brownies and it would basically have been okay. I was glad, though, that I had made the effort with the cake. I brought in the remains of the cake – and there were plenty of remains, a three tier cake doesn’t disappear that easily – and people there, too, commented on how moist and delicious the cakes were, so I was happy. For the challenge, the bakers were asked to make a tiered cake decorated either with chocolate ganache or fondant – I opted for lovely ganache. I made three different flavours of cake: a 23cm peanut butter cake sandwiched and iced with chocolate ganache; a 20cm chocolate cake filled and iced with raspberry white chocolate ganache; and passionfruit mini sandwich cakes, baked in straight-sided mini sandwich cake tins, five of which made up the third tier. They were filled and iced with passionfruit cream (not ganache). The ‘concept’ was that each layer sort of went with the layer above – the chocolate and raspberry, and raspberry and fragrant passionfruit. The peanut butter and chocolate cakes were made with buttermilk and vegetable oil rather than butter and normal milk, which is what gave them their lovely delicacy and tenderness. The peanut butter cake is great in delivering a strong peanut butter hit of flavour, which was good as I didn’t want it to be overpowered by the chocolate. The white chocolate raspberry ganache is – just a word of warning – scrummy but very runny, so you might want to use more chocolate to ensure it’s nice and stiff. It might overwhelm the raspberry flavour, though. My favourite was the sweet and intense, but happily simple, tiny passionfruit cakes. I do think they need to be small because they are powerful. Preheat the oven to 180C. Butter two 23cm round cake tins; cut out two 23cm rounds out of baking paper and line the bottom of the tins. Grease the tins, especially the sides. Sift the flour, baking powder, baking soda and salt into a bowl. Using your electric mixer, beat together the butter and peanut butter in a large bowl that will hold all the ingredients until thoroughly mixed. Beat in the sugar until thoroughly incorporated. Beat in the eggs one at a time, then beat in the vanilla. At low speed, beat in a quarter of the flour, followed by a third of the buttermilk, followed by another quarter of the flour and so on until all the flour and buttermilk are incoporated. As Anna Olson says “start with the dry ingredients and end with the dry ingredients”. Finely chop the chocolate. In a small pan, heat the double cream on medium heat until the edges are just bubbling. Add the chopped chocolate and whisk or stir with a wooden spoon until the chocolate is melted completely. Let cool until thickened and smooth. Place one cake on your serving plate, flat side up (so the domed side is on the plate). Smooth over a few tablespoons of the smooth peanut butter on the flat side using a knife until a thin layer of peanut butter covers the whole cake. Smooth a quarter or so (or however much you like!) cooled chocolate ganache over the peanut butter and smooth to the edges of the cake. Take the second cake and place it on top of the cake, flat side down (so the domed side is on the top). Using a palette knife, smooth the remaining cooled ganache over the sides and top of the cake. If the ganache is too warm, as mine was, it will melt all over the sides and the cake layers will slip and slide around, so it’s much better to wait till it’s cool. Once the cake is iced, let set by keeping in a cool place for an hour or two. If you don’t…there might be an avalanche of sadness later in the evening. Preheat oven to 150C (oh yes. Low) and grease and line the bottom of a 20cm cake tin using baking paper. Finely chop the chocolate and, in a bowl, combine with the hot coffee and stir until melted and smooth. In a bowl, sift together the sugar, flour, cocoa, baking soda, baking powder and salt. In a very large bowl, beat the eggs using an electric mixer until slightly thickened and lemon-coloured. Slowly add the oil, buttermilk, vanilla extract and chocolate-coffee mixture to the eggs, one at a time and beating well after each addition until combined. Pour the batter (it’s quite loose) into the tin and pop in the oven. Bake for about an hour – maybe 50 minutes, maybe an hour and 10 minutes – until a tester poked in the middle of the cake comes out clean. Let the cake cool in the pan for about 20 minutes. Invert and turn out onto a rack. Remove the baking paper bases and let cool completely. When cool, split in half horizontally used a serrated knife. Do be gently because of the very soft and delicate texture of the cake. Finely chop the chocolate. In a small pan, heat the double cream on medium heat until the edges are just bubbling. Add the chopped chocolate and whisk or stir with a wooden spoon until the chocolate is melted completely. In a little saucepan, cook the raspberries over a low heat until defrosted, completely soft and very juicy. Over a small bowl, push the raspberries through a fine sieve using a wooden spoon. Add the puree to the ganache and add the raspberry extract or liqueur. Let cool until a bit thicker. Place one cake half on your serving plate, flat side up (so the domed side is on the plate). Smooth a quarter or so (or however much you like!) cooled chocolate ganache over the cake half and smooth to the edges of the cake. Take the second cake half and place it on top of the cake, flat side down (so the domed side is on the top). Using a palette knife, smooth the remaining cooled ganache over the sides and top of the cake. As the ganache is quite runny, it may pool down – but it goes so well with the luscious cake. Preheat the oven to 180C. Grease your mini sandwich tins. Combine the butter and sugar and beat (with an electric mix or by hand – I did it by hand and if your butter is soft enough, this small amount of batter is easy to mix by hand) until pale, soft and creamy. Fold in the flour, vanilla and passionfruit juice. Mix until combined. If the mixture does not have a dropping consistency (lift up your spoon and gently shake it – some of the batter should drop off), mix in some milk, a tablespoon at a time, until it does achieve this consistency. Pour the batter into your tins and bake for about 15-20 minutes (depending on how deep your tins and how high you filled them – mine were done in 15 minutes). Let cool for about ten minutes in the tins then remove to a wire rack till cooled completely. Take five of your little sandwich cakes and split in half using a knife. Fill and top with passionfruit double cream. Don’t forget to lick your fingers – this cream is divine so don’t complain if it’s made too much for the cakes. Place the iced peanut butter cake on your serving board of choice. Ideally using a cake lifter, but in the real world using spatulas and crying, lift the iced chocolate-raspberry cake and centre it as much as humanly possible on top of the peanut butter cake. Wipe your brows and pick up your five leetle passionfruit cakes and space evenly around the egde of the chocolate cake. Cry with happiness and have a long sleep.